Independent Helicopters Chief Pilot and CEO Featured in Rotorcraft Pro Magazine! Rotorcraft Pro magazine tracked us down to find out what the real story is with our amazing chief pilot, Heather Howley. An online version of the article can be found in the magazine reader, under the Rotorcraft Pro section of just helicopters.com. 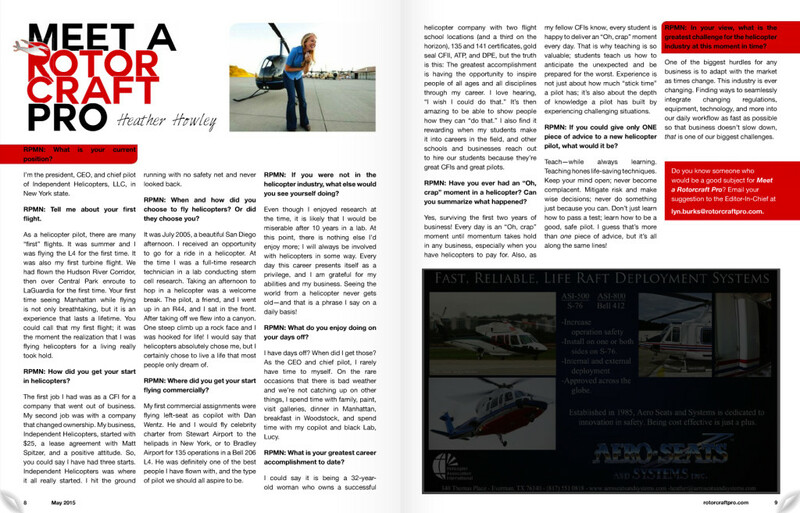 “Meet a Rotorcraft Pro” is a section of the magazine designed to highlight the experience and life of our fellow helicopter pilots, and it is truly an honor to be featured in the pages of such a wonderful magazine. We love the publication; subscribe to Rotorcraft Pro magazine to stay up to date on heli industry news! PS! Don’t forget! Heli Paintball to support the Marius Ivascu Aviation Foundation May 31! Register now!